Abstract: Since its founding in 2009, WASSUP (Water, Amenities, Sanitation Services, Upgrading Program) Diepsloot, a community-based organization, in collaboration with Sticky Situations, a Johannesburg based organisation, has worked against extraordinary odds to improve water and sanitation services in Extension 1, Diepsloot. For over ten years, WASSUP has been repairing and maintaining communal toilet facilities in Extension 1. Working with limited resources, the co-operative has not only developed a sustainable and accountable repair and maintenance model, it has also developed a water tracking system that has helped to generate important data around water use and huge potential cost savings for the City of Johannesburg. WASSUP’s processes and practices provide scope for innovative best practice. The methodology developed is an easily adoptable model that can be applied at scale to existing City infrastructure. On the 28th March a report about the work and research undertaken by WASSUP will be launched in Diepsloot, wrapping up 10 years of community development, 5 years of data capturing, and a final push to local/national government to embed this type of program into existing systems – the findings are clear: it cost R20 million to maintain the status quo, or R1.3 million to fix it and stop the water loss. This session will present the work undertaken by WASSUP, highlighting and reinforcing the important findings and the pressing need for both governmental and private support so as to continue expanding the essential programme both within Diepsloot and to other parts of Johannesburg more broadly. 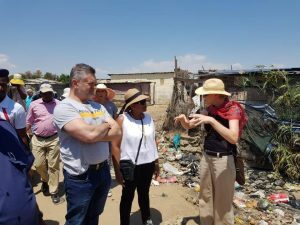 Biography: Jennifer van den Bussche is the founder and director of Sticky Situations, a Johannesburg-based collaborative organisation with a special focus on participatory and community development. A project manager with more than twenty-five years’ experience, she has strong facilitation skills complemented by a background in construction and architecture and extensive experience in community development, and uses these skills to create successful outcomes to a range of projects, including public art, public space and sanitation upgrades and multimedia exhibitions. van den Bussche studied architecture and completed a master’s degree in international and community development at Deakin University, Melbourne, and is also a research affiliate of the Earth Institute at Columbia University’s Centre for Sustainable Urban Design (CSUD), New York. The Faces of the City seminar series is a partnership between the Centre for Urbanism and Built Environment Studies (CUBES) and the South African Research Chair in Spatial Analysis and City Planning (SA&CP) in the School of Architecture and Planning; the Gauteng City Region Observatory (GCRO); and the Wits City Institute (WCI).